Good for you, good for Merton! MCC activist, former newsletter editor and author Ceridwen Davies, recently died of cancer, aged just 63, at St Raphael’s Hospice in Sutton. She was one of our longest serving members, a regular attendee at MCC meetings since the early 90’s where her energetic sense of fun infected us all. MCC member Richard Evans visited Ceri on 11th March, two days before she died. She was at peace in bed at the hospice. He explains, "when I arrived I was mildly miffed that there was no cycle parking, and of course I could not resist mentioning it to Ceri. After all, the lack of bike parking had been a staple topic of debate at MCC meetings for decades. Ceri beamed her broad toothy smile, so I said, flippantly and in jest, that I’d get MCC onto it." The idea has since grown legs, and has approval from both Ceri’s family and the hospice. So MCC would now like to fundraise for and deliver two cycle parking facilities at the hospice – one short term for visitors near the main entrance, like this; and one more secure and sheltered for staff in the car park, like this – in loving memory of our dear friend Ceri. Combined costs are looking to be around £1,600. The hospice has 20 charity places in the Prudential RideLondon-Surrey 100 ride on Sunday 4th August. The entry fee is just £20, and the hospice asks riders to try to raise a minimum sponsorship of £400 each. The hospice will provide a fundraising pack and a St Raphael’s cycling jersey and will be at the event on the day to give support and encouragement. Any additional funds raised will go towards the general running of St Raphael’s which will help to continue providing exceptional hospice care to more people like Ceri. St Raphael’s needs £6 million every year to run and only receives 20% of this from the NHS, so they need to fundraise a staggering £4.8 million every year. Contact EmilyKaniecki@straphaels.org.uk for further information and to get your place on Ceri’s RideLondon Team. 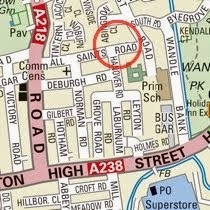 We meet on the first Thursday of the month (except August) at the All Saints Centre at 8pm. All Saints Road, Wimbledon, SW19 1BX. All welcome. Sign up for news about rides, events and products from the London Cycling Campaign and your local group in Merton. Merton Cycling Campaign is part of the London Cycling Campaign. Registered Charity No 1115789. Powered by Blogger.